"An altogether ingenious tour de force." "A book anyone with even the slightest knowledge of Latin can enjoy . . . It does more to attract interest in Latin than Cicero, Caesar, and Virgil combined." 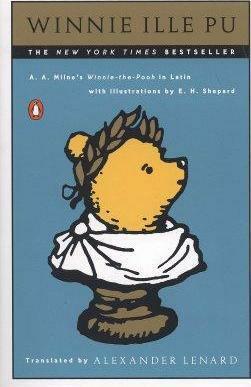 "Pooh has been a classic for so long, it's about time it showed up in a classical tongue." "Surely the ultimate canonization of a great children's classic." "A brilliantly funny book . . . Nothing is skipped, every word is there." "Proof that humor is not dead, even if Latin is supposed to be." "It is hard to conceive of a Latin work more calculated than this attractive volume to fascinate the modern public, young and old." --The Washington Post "A book anyone with even the slightest knowledge of Latin can enjoy . . . It does more to attract interest in Latin than Cicero, Caesar, and Virgil combined." A. A. Milne was born in 1882 in London. He was a playwright and journalist as well as a poet and storyteller. His classic children's books were inspired by his son, Christopher Robin. Milne died in 1956. Born in Budapest in 1910, Alexander Lenard was a graduate of the famous Theresianum in Vienna. A refugee from Hitler who migrated to Brazil by the way of Rome, he worked variously as a pharmacist, math teacher, quiz show contestant, farmer, painter, poet, and pianist as well as, of course, a translator. At the time of his death in 1972 he was fluent in twelve languages. Winnie Ille Pu was the product of over seven years of work, beginning with a German translation of the famous classic in 1951, on which A.A. Milne personally congratulated him.